We've probably all heard that we need to get more Vitamin D or calcium right? We've all heard of the different B vitamins, but do any of us really know what good they do? I, for one, didn't so I decided to look up some of the most common vitamins and minerals that we need and see what it is that they do for our bodies. I hope you learn something you didn't know before, I know I did! First things first, there are two types of vitamins. We'll discuss them below. Fat Soluble Vitamins are stored in the fat tissues within our bodies and the liver. These vitamins can be stored from several days to six months. Our bodies store them until we need them. Vitamins A, D, E, and K are fat soluble vitamins. Because these vitamins are stored for some time there is a risk of vitamin poisoning. It's important to ask your doctor what amount of vitamin you should be getting daily. Water Soluble Vitamins don't get stored in the body. These vitamins flow through the bloodstream and water ever your body doesn't need comes out when you use the bathroom. 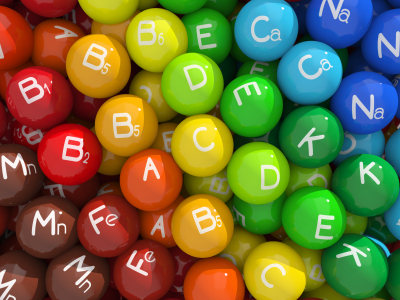 Water Soluble Vitamins have to be replenished more often than the fat soluble vitamins. Because the excess vitamins are flushed out, there is a less likely chance of getting poisoning from these vitamins. Again ask your doctor for the recommended daily dose. Vitamins C, B1, B2, B6, niacin, folic acid, biotin, and pantothenic acid are all water-soluble. Now that we've discussed that here is a list of the most common vitamins and a few minerals and what they do for us. Vitamin A is important to eyesight. It helps us see at night and see colors vividly. Vitamin A is also important for growth, our appetites and taste. Vitamin A is destroyed by fatty acids. Sources of Vitamin A: Liver, carrots, sweet potatoes, cantaloupe, kale, collards and spinach. Signs of Vitamin A deficiency: Night-blindness. There is more than one B vitamin and I'll break them down in a bit, but all B vitamins are important for our metabolic activity. They make and release energy and are important in making and maintaining red blood cells. B1 or thiamine is good for the nervous system, digestion, our muscles and heart, and alcohol-damaged nerve tissue. B1 is destroyed by high temperatures, alcohol and coffee. Sources of B1: Liver, yeast, egg yolk, cereal, red meats, nuts and wheat germ. Signs of a Vitamin B1 deficiency: Tingling in fingers and toes, confusion, poor balance, loss of appetite, exhaustion and weakened powers of concentration. B2 or riboflavin is good for our growth, nails, skin, hair, sensitive lips and tongue, eyesight, and the breakdown of protein, carbs and fat. B2 is destroyed by light and alcohol. Sources of B2: Milk, liver, yeast, cheese, green leafy veggies and fish. Signs of a Vitamin B2 deficiency: Itchy or irritated eyes, itchy nose, mouth, or throat, and cracked corners of lips. B6 or pyridoxine is good for preventing some skin conditions and nerve problems, and it helps our bodies absorb protein and carbohydrates. B6 is destroyed by contraceptive pills, roasted or boiled foods, alcohol and estrogen. Sources of B6: Fish, bananas, chicken, pork, whole grains and dried beans. Signs of a Vitamin B6 deficiency: Skin inflammation. B12 or cobalamin is good for making red blood cells and the formation of nerves. B12 is destroyed by water, sunlight, alcohol, estrogen and sleeping pills. Sources of B12: Eggs, shellfish, poultry, meat, liver, milk, cheese, and fortified cereal. Signs of Vitamin B12 deficiency: Tiredness and fatigue, tingling and numbness in the feet and hands, memory problems, and anemia. Vitamin C is important for keeping body tissues, like our gums and bones, in good shape. It is good for our immune defense system, protection form viruses and bacteria, healing wounds, reducing cholesterol, and preventing scurvy. Vitamin C is destroyed by boiling food, light, smoking, and heat. Sources of Vitamin C: citrus fruits like oranges, cantaloupe, berries, tomatoes, cauliflower, cabbage, kiwi, potatoes, and peppers. Signs of Vitamin C deficiency: Tiredness, bleeding gums, and slow-healing wounds. Vitamin D is the vitamin we need for strong bones and teeth. It also helps our bodies absorb the amount of calcium we need. Vitamin D is destroyed by mineral oil. Sources of Vitamin D: Sunlight, this is the best way to get Vitamin D. Cod liver oil, sardines, herring, salmon, tuna, milk and milk products are also good sources. Signs of Vitamin D deficiency: Unhealthy teeth, osteomalcia, or the weakening of bones, and rickets in kids. Vitamin E is good for fighting toxins, it is a powerful antioxidant. Vitamin E also protects our cells and tissues from damage. Vitamin E is destroyed by heat, oxygen, frost, iron, and chlorine. Sources of Vitamin E: Nuts, vegetable oil, broccoli, sprouts, spinach, eggs, and whole meal products. Signs of Vitamin E deficiency: Weak muscles and fertility problems. Vitamin K helps our blood clot. Sources of Vitamin K: Green leafy veggies, dairy products, broccoli, soybean oil. Folic Acid is good for the production of red blood cells. Folic acid is destroyed by water, sunlight, and heat. Sources of Folic Acid: Carrots, liver, yeast, egg yolks, melon, apricot, pumpkin, avocado, beans, rye, and green leafy veggies. Signs of Folic Acid deficiency: Tiredness due to anemia and red tongue. Here is information on four common minerals we all need! Zinc is good for our immune systems and breaking down fat, protein, and carbs. Sources of Zinc: Meat, shellfish, milk, brown rice and whole grains. High doses of Zinc can lead to stomach pain, nausea and vomiting. Signs of Zinc deficiency: Lesions on skin, eyes or in throat, loss of taste and smell, hair loss, diarrhea, slow healing of wounds and growth problems in kids. Magnesium is good for converting energy from food, cell repair, strong bones, teeth and muscles, and regulating body temperature. Sources of Magnesium: Green leafy veggies, whole grains and nuts. High doses of Magnesium can lead to diarrhea. Signs of Magnesium deficiency: Muscle spasms, and has been associated with heart disease, diabetes, high blood pressure and weak bones. Iron is good for red blood cell and muscle function, while blood cells and the immune system. Sources of Iron: Lean red meat, oily fish, egg yolks, green leafy veggies, nuts, whole grains, and whole wheat products. High doses of Iron can lead to constipation, vomiting, nausea, diarrhea, and in some extreme cases can be fatal. Signs of Iron deficiency: Tiredness, irritability, and difficulty concentrating. Calcium is good for strong bones and teeth, nerve function, muscle contraction and blood clotting. Sources of Calcium: Milk, cheese, butter, yogurt, and green leafy veggies. High doses of Calcium can lead to headaches, stomach pain, high blood pressure and diarrhea. Excess calcium can also be deposited as kidney and gall bladder stones. Signs of Calcium deficiency: Poor teeth and brittle bones. If you think you might be lacking in your vitamin intake go visit your doctor and they'll be able to tell you what to do!